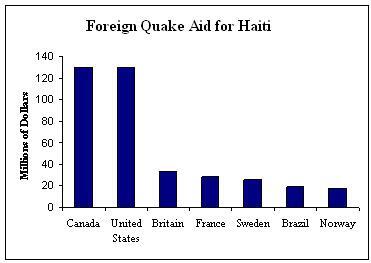 According to the Associated Press, countries have pledged nearly $1 billion in aid to Haiti. As one of the highest government donors, Brazil promised $19 million in aid. The country also delivered 200 tons of food, water, tents, medicine, and medical equipment. Brazil sent 50 firefighters specialized in search and rescue, as well as 46 doctors and nurses. About 1,300 Brazilian U.N. peacekeepers are currently operating in Haiti; eighteen military officials died in the earthquake last week.